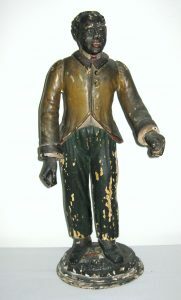 Wonderfully carved wood and paint decorated 19th C. carving of a freed slave. Note the Liberty Cap at his feet. The Liberty Cap is often associated with freeing a slave in America. Great expression and carving details. May have been a counter top tobacco figure. Original paint with some losses. 24 ” tall. 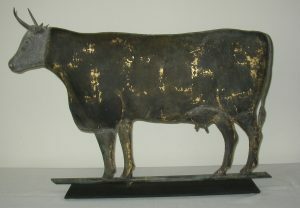 Impressive early (c. 1875-80) copper and zinc cow weathervane with very old, if not original, weathered surface, including residual areas of gold leaf squares. Excellent original physical condition with no bullet holes or repairs. Head, horns and tail are well done in cast zinc, also showing residual areas of gold leaf. Possibly a Cushing product. 27 1/2″ long, 19″ tall at the horns. 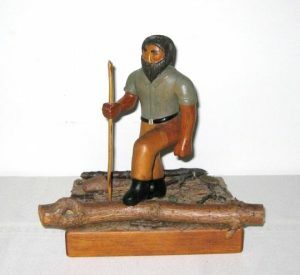 Very well carved and painted wood mountain man or lumberjack diorama depicting him as he walks through the woods. The ground shows logs, sticks and rocks. Signed on the base “Ray 3-89″ (March 1989). A good folk art piece in excellent original condition. Found in Central Michigan. 8 5/8″ high, 9″ wide and 5 3/4” deep.